Our Nephrofit, a liquid form Poultry Feed Supplement, is widely demanded in the market due to its effective performance. 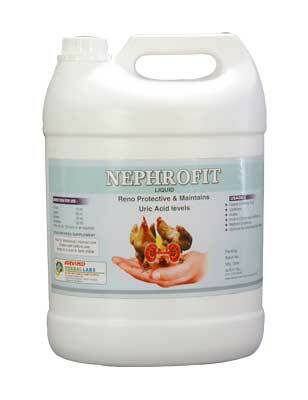 Our Nephrofit is an excellent Reno protective and maintains Uric Acid levels in poultry. Kidneys are vital organs of the excretory system of the body. They play a very important role in the regulation of the internal environment of the body as well as the volume and composition of body fluids by eliminating non-volatile wastes of tissue metabolism, ingested foreign substances and undesirable substances present in excess. They also play a major part in regulating the acid-base balance & osmolarity, and hence volume of the body water. Nephrofit is a unique combination of herbs which is safe effective renal tonic, uricosuric and diuretic. Nephrofit clears urinary tract infection & provides antiseptic coverage. Acute or Chronic renal insufficiency. Optimises the functioning of the kidneys.